I received this in the mail on Saturday. These three CDs that I had only just talked about with one of my girlfriends. See, a week or so before I was texting with a dear friend of mine about my 2014 anthem, Brave by Sara Bareilles. She had told me that she had her CDs and would burn them for me. Oh, I was so excited! I'd have these burned CDs and drown myself in them. Listen to them all day and hear a voice singing my brave to me and all the others lyrics I needed to hear. 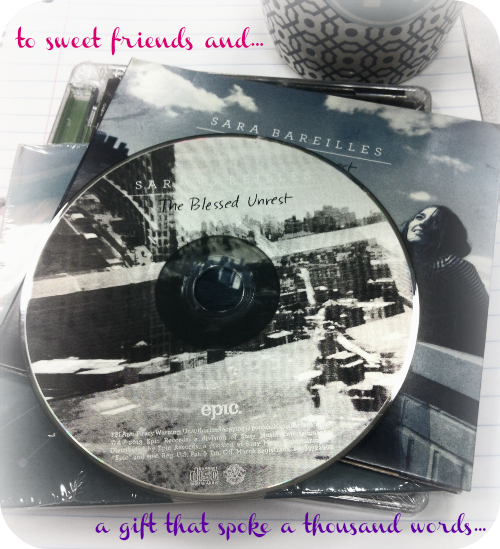 I would quickly fall more into love with Sara Bareilles and envelope myself in her inspirational and empowering music. I had a plan! I tore that thing open! My sweet friend outdid herself. Three original CDs, with one of them being her live concert version with DVD! Those happy fat tears ran down my cheeks. Yes, because of a packet of CDs. It really isn't the gift that took my breath away. It's the thought behind it. That I am special to her. That I matter enough. That she knows that I can be brave enough. I got all of that from this gift. it was because of another friend that said when she heard certain lyrics in Brave she thought of me. That was a gift in itself. when I thought I was no longer able to. By being an example to me. Sara Bareilles is playing in the background as I write this post. Love that only a friend can give. Thank you God for these gifts you have given me in them.